Pulse is an application that automatically downloads wallpapers from the web using given keyword. At this time it uses http://rewalls.com to get wallpapers. There are thousands of beautiful wallpapers with different resolutions. 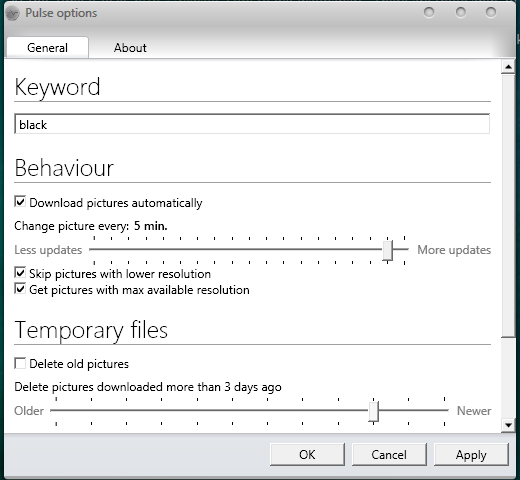 Pulse automatically chooses wallpapers with your screen resolution. You can make it to skip wallpapers with lower resolution or to get wallpapers with original size. This is perfect when you don’t want to waste disk space for saving wallpapers, but like to change the wallpaper from Internet. This software is really perfect for Netbooks.